Teaching English or German by the beach! 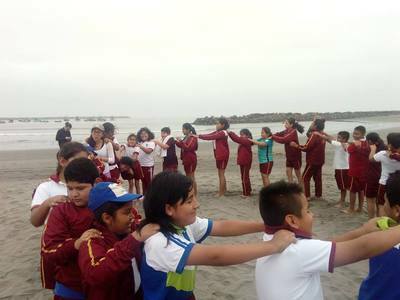 We are trying to help children from Salaverry community to improve their English or German skills. We have around 50 kids from 04 to 15 years of age. Broad their view of education and the world around them is a must. The teacher will be with an assistant volunteer. Volunteers will help in the grammatics, pronunciation of English or German. For the basic English/German classes, the volunteer will take as reference books, pdfs, etc. Café da manhã: Você ganha café da manhã gratuito todos os dias que ficar aqui. Jantar: Você ganha jantar gratuito todos os dias que ficar aqui. Aulas de Yoga: Participe gratuitamente das aulas de yoga no nosso espaço. Aulas de surf: Participe gratuitamente das nossas aulas de surf em praias da cidade. Aulas de dança: Participe gratuitamente das aulas de dança no nosso espaço. - Spanish is not required by our organization, but it is highly recommended that a basic level is acquired prior to arrival to assist in day-to- day life here. - Ability to work in a team. - Responsible and committed to fulfilling the tasks assigned. - The volunteers are allowed to contribute in class with creative ideas, games, dynamics, etc., as long as they are related to the topics they are working on within the curriculum. - In each classroom, there must be a minimum of two volunteers per classroom. - The first weeks of work, the new volunteers will be accompanied by assistant project, old volunteers to get to know the classrooms and students. - Volunteers will be needed to help at the school with Kindergarten program, primary program and secondary program an average of 2 - 3 hours per day working both mornings and afternoons. - The volunteers should dress modestly, nothing extravagant.